After on arrival at Delhi Airport/Railway station and meet our representative and drive toward to Shimla. After arrival at Shimla checkin hotel and Overnight stay in Shimla after dinner. 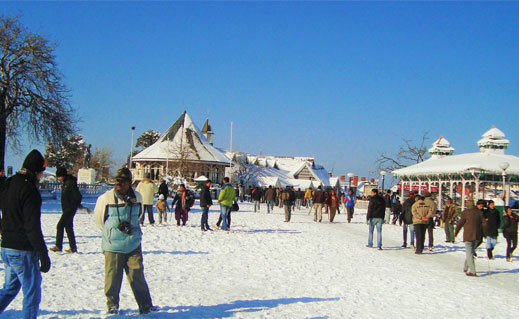 Second day of trip get enjoy of local sightseeing of Shimla and Visit Jakhu temple and Kufri. Jakhu temple is located on the top of hill in Shimla and dedicated to lord Hanuman. After darshan of Jakhu temple drive to Kufri which is situated at an altitude of 2500 meters just an hour’s drive from Shimla. Come of from visitng of Kufrim visit famous Ridge & Mall Road, Kali Bari, Scandal Point and Gaiety Theater. Come back at hotel after sightseeing and overnight stay at Hotel. After breakfast early morning travel proceeds to manali by road, between distance both around 274 kms / 7hrs. On the way visit other famous local sightseeing like Sundernagar Lake, Pandoh dam, Vaishno Devi Temple, Kullu, Manikaran. Arrival at Manali in evening checkin hotel and overnight stay at hotel in Manali. After getting healty breakfast start journey toward to visit Rohtang snow point which is loated 51 km from Manali at an altitude of 3978 meters. Rohtang Pass is one of romantic place of Himachal Pradesh which attracts many of couple for their honeymoon in Shimla. After sightseeing Rohtang Pass come back on the way back from snow point visit Solang Valley and overnight stay in Hotel. After breakfast visit "Temple Hdimba". It was built in 1553 a pagoda roof with four tared Superbly Krafted habitat, It is famous for its carved Durway Akskvisiteli. The clubhouse with extensive features under "Clubhouse," a roller skating rink, an auditorium, billiards room, a library, a bar and restaurant, include Max were wonderful day outing. "Tibetan monastery, Van Vihar, and "Vasishta" is well known for its hot springs. There ply Vashisht and oldest temples dedicated to Lord Rama. Overnight stay hotel.